Michael and I didn't know what to expect: we trusted Liz's eating recommendations, and by extension, this restaurant's. 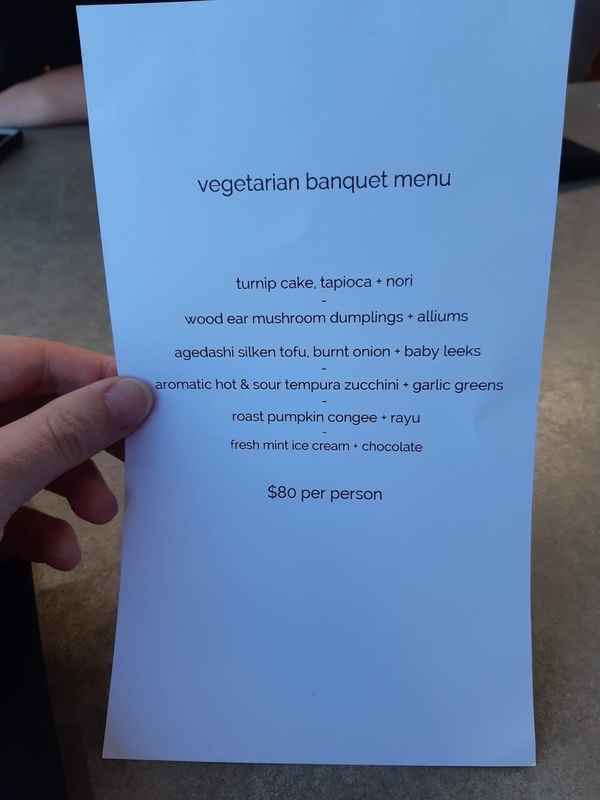 The less elaborate of the banquet menus is $80 per person, and there are explicit vegetarian, vegan and coeliac versions of it available. There's no problems mixing and matching those different versions of it at one table. 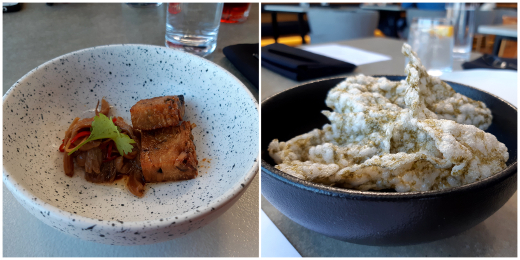 For our first course, Michael and I shared a bowl of tapioca and nori crackers, and then received our own little bowls of crisp-edged turnip cakes. 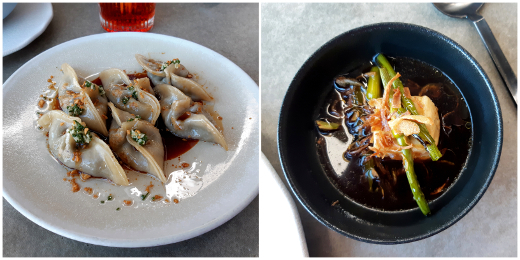 There were enough wood ear mushroom dumplings to share around the entire table. The vegetarian accompaniment was a small bowl of agadashi tofu in a deeply flavoured broth with burnt onion and baby leeks. 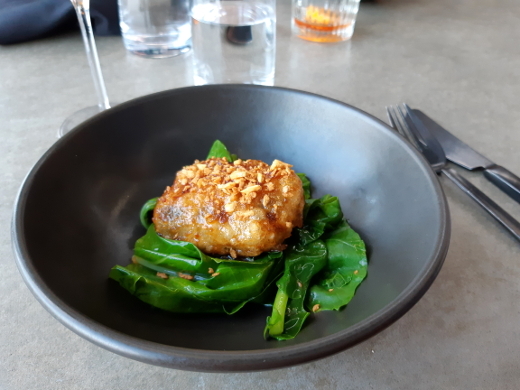 The table favourite was the same course for both omnivores and vegetarians: in our case, the watery texture of zucchini was at its best encased in a thick, crunchy tempura batter. The batter was coated in hot and sour sauce, and it all sat on a bed of garlic greens. 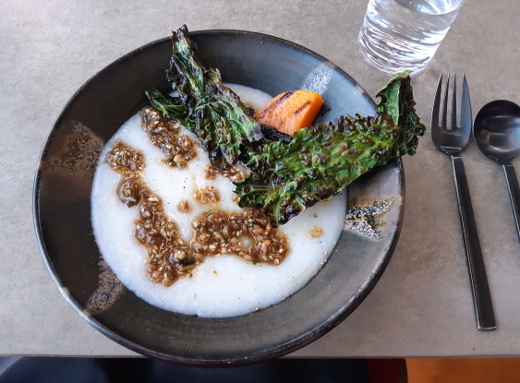 I was skeptical that our main course of congee would be more filler than flavour, but I was very much mistaken! Crisp-baked greens and roast pumpkin kept the texture varied, and there was plenty of rayu to liven up every mouthful of rice. This would make a terrific meal on its own. After a series of savoury course drawn from across Asia, dessert had different roots. 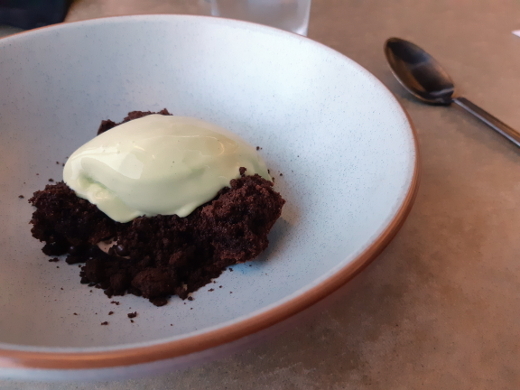 I was well satisfied by the crumbled chocolate brownie, with little bubbles of dark chocolate and a scoop of fresh mint icecream. The team at Aløft have really figured out how to create intense, savoury flavours for vegetarians. Service is great, and the setting is remarkable. This a special occasion experience with plenty to offer both locals and visitors. 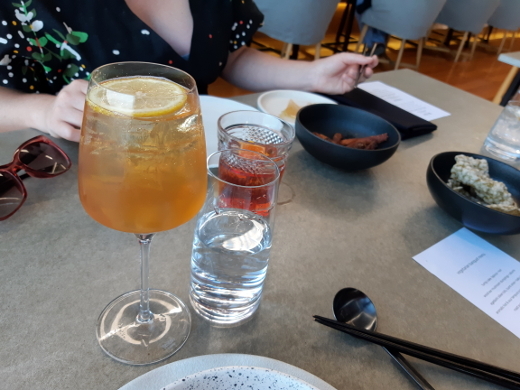 You can read more positive accounts of Aloft on blogs Fork + Foot, Living Loving Hobart (twice), Just The Sizzle, and Linnie Eats All The Food. 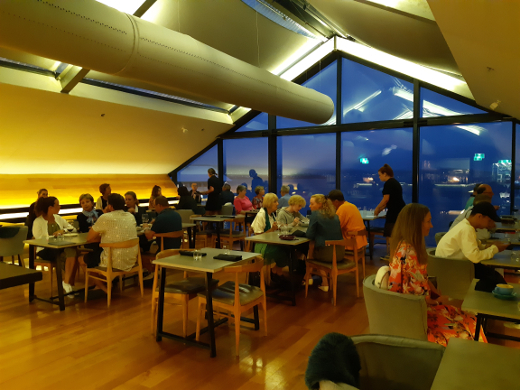 Accessibility: Standard access to Aloft is via a small flight of stairs; contact the restaurant to find out if there alternative access via a lift. Tables and chairs are arranged with a moderate amount of space (see photo above). We didn't visit the toilets.